Doggerel and nonsense drawn from a New York lamp post. What shall we be, When we aren't what we are? We aren't what we are; we're what we do. Relax. 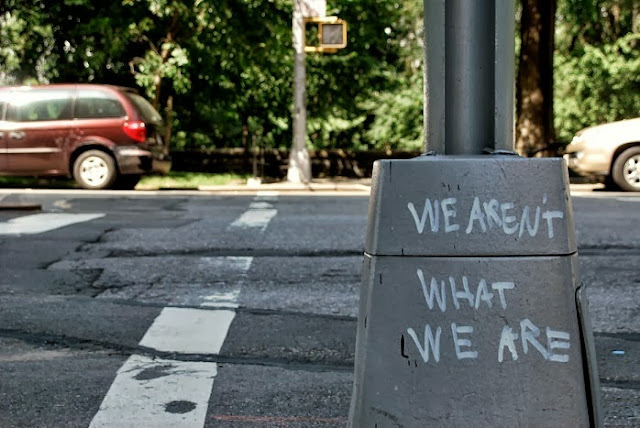 We aren't what we are. We aren't what we are really watching. We aren't what we are today. What shall we be when we aren't what we are? We aren't what we are willing to settle for either. What will we become, when we aren't what we are? We aren't What we are distributing rumors. What if we aren't what we are now?